This new addition to New Studies in Biblical Theology is a detailed study of the Promised Land as a canonical link from Eden to Kingdom. The land theme is important because it connects various biblical covenants into a developing story of typological fulfillment of God’s plan to redeem humankind. As is often observed, the kingdom described in Revelation is very much like the Garden of Eden. Martin shows how the beginning and the end are connected through the entire grand narrative of Scripture. Quoting Jon Levenson, Martin quips “eschatology is like proctology;” the beginning corresponds to the end (56). But each successive stage in God’s redemptive plan escalates the typology so that the end of the story is not just a restored Eden on earth, but an entirely new Heaven and Earth. In the first two chapters Martin develops his view that the Promised Land is a typology found throughout the canon. Beginning with the creation story, he traces the development of God’s redemptive plan, arguing Eden is the ideal kingdom ruled by God. Humans rebel against the king in the Fall and the effects of sin separate humans from God. The rest of the Bible is therefore the story of God’s plan of redemption. God is “reestablishing his kingdom through covenant” (42). These covenants (Noahic, Abrahamic, Mosaic, Davidic, and the New Covenant) are something like stages in God’s plan to restore Eden in the eschatological Kingdom of God. With respect to the New Covenant, Martin point to Jesus’ preaching of the presence of the Kingdom in his ministry as an “already established” restoration of Eden in the church. Yet he sees a still future new creation and kingdom coming in the eschatological age. Having offered something of a sketch of the whole canon in chapter 2, Martin then provides the details of this developing typology on in chapters 3-9. For much of the Old Testament the promise of restoration is a future hope. While it is true Abraham does dwell in the Promised Land and the Israelites eventually return to the Eden-like Promised Land, the glorious return of Eden remains a tantalizing hope for a future restoration from exile. The promised restoration of God’s rule is in some ways “already” fulfilled, but in other important aspects, “not yet” fulfilled. The hoped-for restoration from the Exile was inaugurated in the person and work of Christ. While it is difficult to trace Promised Land themes in the teaching of Jesus (117), Martin suggests Jesus’ preaching of the kingdom was an inauguration of the Kingdom and the promise of the land finds its fulfillment in Jesus. This is not a radically new suggestion, although it is critical for some of the theological reflections later in the book. Martin attempts to find this same sort fulfillment in the epistles as well. There is, however, little in the Epistles that could possibly be taken as typology of the Land Promise. I found the brief material on Paul to be unrelated to a typology of Land, but Hebrews clearly uses a typological method and describes Jesus as a fulfillment of the whole Old Testament, including the rest Israel experienced when they entered the Land. Canaan is functioning typologically in Heb 3:7-4:13, for example, and there is a shift in chapters 12-13 from Sinai to Zion. More work is needed here since it is not clear from Hebrews that the fulfillment of the Land Promise to Abraham is wholly exhausted in the person and work of Jesus. The book would have been better served to omit everything except the material on Hebrews. Martin describes the fulfillment of the promise in the book of Revelation, the shortest chapter in the book despite the fact Revelation has strong typological ties to the restoration of the Promised Land to God’s people. Martin’s focus in this chapter is almost entirely on the New Jerusalem and new creation as a restoration of the Edenic Temple. While this critique falls under the category “I would have written this part differently,” I do think Martin has missed a great deal which could support his overall thesis by limiting his brief comments in this way. For example, there is a great deal of “new exodus” language in Revelation, especially in the sequence of seven trumpets. The call to leave Babylon in Rev 17-18 could be understood as an allusion to the call to return from exile and return to the Land in Isaiah 40-66. Dispensationalists maintain a distinction between Israel and the Church even in the present age and argue the Abrahamic covenant was unconditional and not wholly fulfilled in either the Old Testament nor in the Church. They look forward to a real fulfillment of the “land promise” in a future, literal kingdom of God. Since Martin’s study argues the Land Promise is fulfilled typologically in the work of Christ, the Church becomes God’s new covenant people. Yet Martin does say “all God’s promises find their ultimate fulfillment in the person and work of Christ as the culmination of God’s revelation and redemptive plan” (170), so there is still a future new creation which will continue (conclude?) the typological pattern of Eden. To my mind, this is an arbitrary limit placed Martin’s principle of typology expressed early in the book. If each successive use of a typology escalates, then the final restoration after the Parousia ought to be the most complete fulfillment possible. Dispensationalists include a restoration of Israel as God’s people in this ultimate fulfillment of the promise, Martin does not. Conclusion. Martin has certainly delivered on his promise to create a biblical theology of the Promised Land. This book argues for the Land as a typological link throughout the various covenants of the Old Testament, covenants that find their fulfillment in the person of Jesus. Martin has contributed to the discussion of the over-arching plot of the whole Bible by pointing to the restoration of Eden as a possible controlling typology. Burge, Gary M. A Week in the Life of a Roman Centurion. Downers Grove, Ill.: InterVarsity, 2015. 189 pp. Pb; $16. Link to IVP, includes a short book trailer featuring Burge. Burge says the modern reader is like “a foreigner in their world and culture,” this book attempts to immerse us in the world of the first century. In the same vein as Ben Witherington’s A Day in the Life of Corinth or Bruce Longenecker’s The Lost Letters of Pergamum, Burge has created a short story about a centurion named Appius and his scribe and slave Tullus. While stationed in Dura-Europos, Appius is injured in a battle with the Parthians and eventually is in a gladiator arena at Caesarea Maritima. Eventually Appius and Tertullus end up in the small village of Capernaum on the shores of Galilee where the meet Jesus of Nazareth. I will not spoil the novel with any more plot summary. The value of this book for Bible students is found in the numerous side-bars with detailed cultural information on such diverse cultural issues such as honor and shame, familia, or cosmetics. Burge describes the various locations mentioned in the book in the sidebars as well. There are small black and white illustrations scattered through the book. These are all informative, but could have been enhanced by added a “for further study” to each topic with reference to a more detailed source. Assuming use in a classroom, students could be encouraged to pick a topic and research it in more detail. A Week in the Life of a Roman Centurion is a great way to get into the world of the New Testament and would be used in a New Testament introduction or a Gospels class, in the same way A Day in the Life of Corinth is appropriate for a book on the Pauline letters. I am occasionally asked for resources on the “background” of the New Testament, this short novel will serve the average Bible reader well by illustrating the Roman world and enriching one’s reading of the Gospels. Pelton, Randal E. Preaching with Accuracy. Grand Rapids, Mich.: Kregel Ministry, 2015. 170 pp. Pb; $16. Link to Kregel, read a 25 page excerpt from the book. This short book of preaching is in many ways a combination of Haddon Robinson’s classic Biblical Preaching and Bryan Chappell’s Christ-Centered Preaching. Pelton recognizes his debt to both books in his introduction. He believes the preacher needs to develop the ability to identify the dominant idea of a preaching portion, but also to allow the language and concepts of the portion to shape the sermon. The first chapter of the book is a defense of expository preaching. For many preachers, exposition of a text in a sermon is not popular with audiences. Expository sermons will not “grow a church.” It is unfortunately true many congregations lack the biblical background to appreciate an expositional sermon and fewer pastors are attempting to “preach through a book.” I have found that even when a pastor preaches a series on a biblical book, the sermons will still be topical and only vaguely related to the selected text. This book by Pelton will help pastors to pay attention to the main idea of a text a selected text and conform their presentations to the Word of God rather than using scripture as a pretext for the hot topic of the week. Pelton’s model for preaching begins with selecting an appropriate text to preach. He calls this “cutting the text,” although he is simply demonstrated for the reader how to identify a proper unit of scripture for preaching. Topical preaching tends to err by using a single verse (sometimes out of context) or by jumping to as many verses as possible. Expositional preaching can be ruined by trying to reach too large of a section, forcing the pastor to rush the details or bore the listeners with story-retelling. By paying attention to the genre-based clues in the text itself a pastor ought to be able to limit their expository sermon to an ideal number of verses. By “cutting the text” properly, the expositor will then be able to identify the “textual big idea” in the portion. Pelton’s fourth chapter demonstrates how to select the broad subject, to narrow the subject to the preaching portion and finally to develop the “big idea” which will govern the content of the sermon. He gives several examples and has a number of “workbook” like exercises to allow the reader to develop their own “big idea” and compare it to his own work. In his final major chapter, Pelton describes what he calls “canonical preaching.” By this he more or less means preaching Christ in every text. This many take the form of what Christians ought to be or do, or how Christ is revealed in a particular text. He is careful to avoid the allegorical “fuller meaning” of medieval preaching which found Jesus in every word of the Old Testament. Pelton firmly believes every text ought to point to Jesus and apply to the Christian and a sermon should be a kind of “theological exegesis” pointing the way to the Cross. This is not unlike Bryan Chapell’s “grace-centered preaching” or Sidney Greidanus’s method for preaching Christ from the Old Testament. While Pelton makes some distinctions between his approach and these other two popular homiletical texts, all three are working similar methods with the goal of preaching every text in the larger context of the whole canon. If I have any critique of Pelton’s approach, it is this canonical method. On page 118 he has a chart comparing his method to a target, with the textual big idea on the outside, the contextual in the second ring and the canonical interpretation in the center of the bull’s-eye. Until I saw this chart, I would have place the textual big idea in the center and the canonical interpretation on the outside. For me, the idea in the text I have selected is the driving force in my sermon and (perhaps to my shame) I often do not consciously attempt to draw the text to the larger canonical context. Pelton’s book is an encouragement to re-think what is important in a sermon and to center my presentation on the Cross. NB: Randal Pelton blogs on Preaching at Pelton on Preaching. Thanks to Kregel Books for kindly providing me with a review copy of this book. This did not influence my thoughts regarding the work. The highlight for most of the students on the drive from the desert was a stop near Beersheva for one more visit to Aroma Coffee, but we did stop at the Valley of Elah for a short walk in the general area of the well-known battle between David and Goliath (1 Sam 17). We talked about the story for a few minutes and most people took a stone or two from the dry river bed. I have often wondered where all those stones come from, since every American tourist seems to take a handful home with them. We spent our last four hours in the Old City. 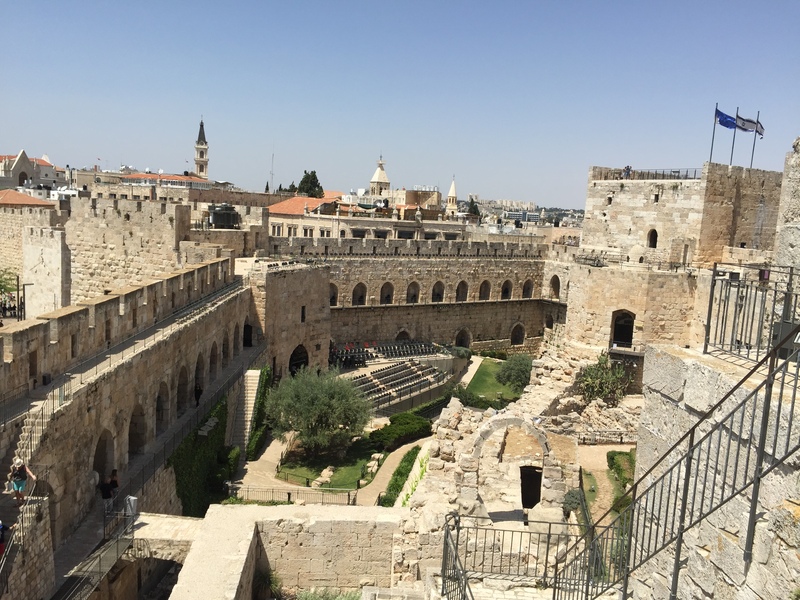 Some of the students revisited the Holy Sepulcher, others walked back to the Western Wall, and a few went all the way to the Pool of Bethesda. I visited the Tower of David exhibition just inside the Jaffa Gate with Josh and Lisa Tweist. I have never gone through this site before and it was well worth the shekels. They have done a nice job making use of the limited space to present Jerusalem from the Hasmonean era through Herodian, Crusader and Ottoman periods. We were in a bit of a rush since the Museum closed at 3PM, but were able to seem most of the outside displays. There are two maps of Jerusalem within the site, one small model of Jerusalem at the time of Herod is designed like the National Park models. It is rather small, but should give some basic orientation to the Old City. Near the exit is a larger model created in the later 1800s by Stephen Illés. This is a fascinating map since it is a model of the city as it was seen by Illés in 1864-1873, showing the height of Robinson’s Arch for example. For anyone who has been around the Old City for a while, this model is worth visit. After the Tower of David I visited the Christ’s Church bookstore and then camped in their coffee shop for an hour and a half for some quiet reading and espresso before getting to the airport for the late flight back to the states. Overall, this was one of the best student trips I have had the pleasure of leading. The students were always interested and excited about what we did each day and asked great questions. Now that I am back, I plan on editing the previous dozen posts (writing on an iPad is always an adventure!) I will also add a few more pictures for days I was unable to transfer my photos, so check back in a few days for some updates. Since we arrived earlier than the big tour buses from Jerusalem we were the only people at the waterfall for most of the time we spent there. I thought there was far less water than in the last two or three visits, the pool was certainly much smaller. 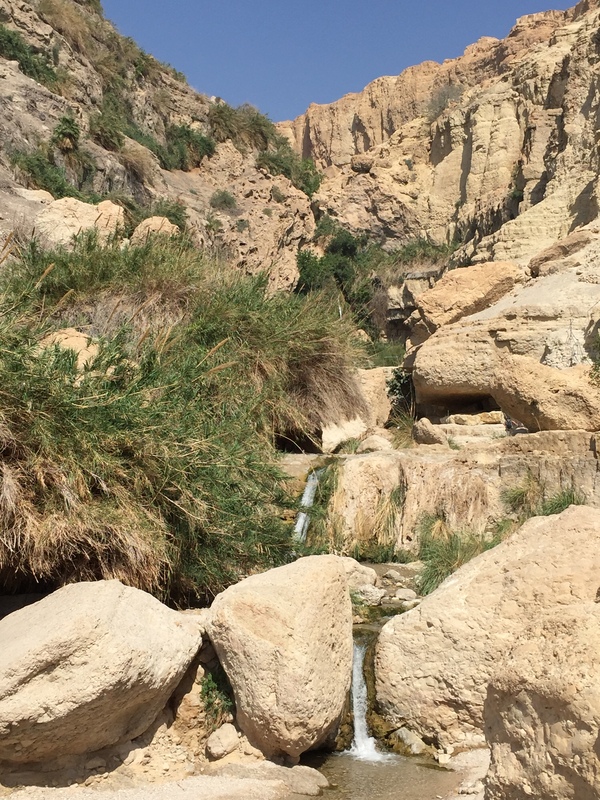 We saw a very conservative Jewish family hiking in full black coats a first for me at En-Gedi. Aside from being hot in the sun, I thought it was interesting the children were playing in the water in there long black coats! One warning for anyone driving to En-Gedi: there is a serious road construction project in front of the En-Gedi with a detour and traffic jam caused by one-lane traffic. The public beach across from En-Gedi is closed as is the gas station and resturant. I had planned to picnic at the beach, but had to adjust and eat at Qumran. Getting to En-Gedi early means a hot afternoon at Qumran. After the vertigo-inducing video we walked out the the archaeological site, working our way quickly to the shaded viewing area of the cave. This was a particularly good time of discussion of who the Essenes were and why the the Dead Sea Scrolls are important. It also gave me a chance to correct the goofy suggestion in the video that John the Baptist was once part of the Qumran community. Funny story: when I was giving some explanation in the little museum after the video, a young Jewish couple from New York hanging around listening. 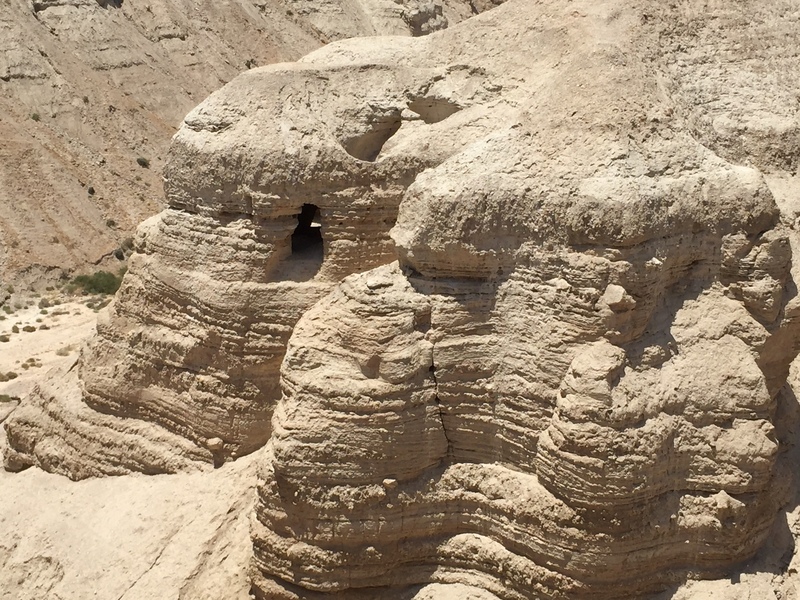 I chatted with them a bit and they were visiting Qumran for the first time. The stayed with us for most of our talk and seemed really interested. Strangely this was the second time someone has joined us on the tour. After some shopping at Qumran, we drove to a beach for a float on the Dead Sea. There was a large group of American Jewish high schoolers, but they left soon after we arrived. Most of the students chose to float in the warm water, several collect some salt to stink up their luggage on the trip home. We enjoyed some excellent kosher pizza before heading back to Tamar for the night. Most of us are very tired after ten solid days of hiking, yet as I write everyone is hanging out playing games and snacking. I hear some of the students are planning on hiking up a hill behind Tamar to watch the sunrise. It really is a spectacular view and I wish them well. We head to Jerusalem tomorrow for final shopping in the Old City and then to the airport for home.